Do your ears ever hurt when you take your headphones out after a long day at the office? Well, those days are gone. An alternative earbud is here that allows users to enjoy their favorite music and podcasts all day without discomfort. Meet the Comfort 200 Foam Tips. The Comfort Series (Ts/Tsx-Series) Foam Tips have been designed for all day use. All Comply™ Foam tips are comfortable, but these Comfort 200 Foam Tips take natural usage to the next level. 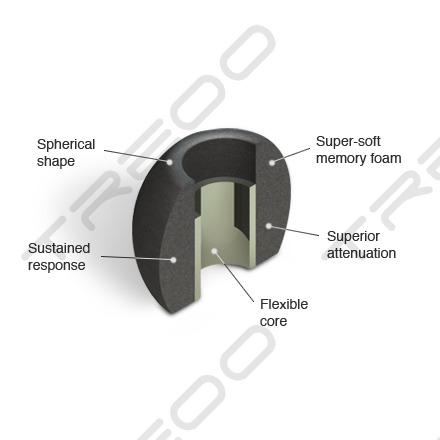 With their innovative configuration, the Comfort 200 Foam Tips utilize a spherical design that puts less stress on the ear canal. Due to their unique design and makeup, the Comfort 200 Foam Tips gently mold to your ear canal to deliver peak sound quality while filtering out background noise. By employing our proprietary foam blend, the new Comfort 200 Foam Tips are 30 times softer than silicone, resulting in all day comfort. When tunneling sound directly into your inner ear canal, you’ll be able to hear a fuller sound quality than you would with standard headphones. The Comfort 200 Foam Tips are perfect for those who listen to music throughout their work day or for those who have long commutes. You’ll be able to block out crying babies, blaring horns, and your fellow passengers and focus on your entertainment of choice. The Comfort 200 Foam Tips are the ultimate in-ear headphone upgrade. Best for: Commuters, travelers, audiophiles, music-enthusiasts, and office workers. With the Comfort 200 Foam Tips you can listen at work, on your morning commute, or on long-distance flights with comfort and ease. 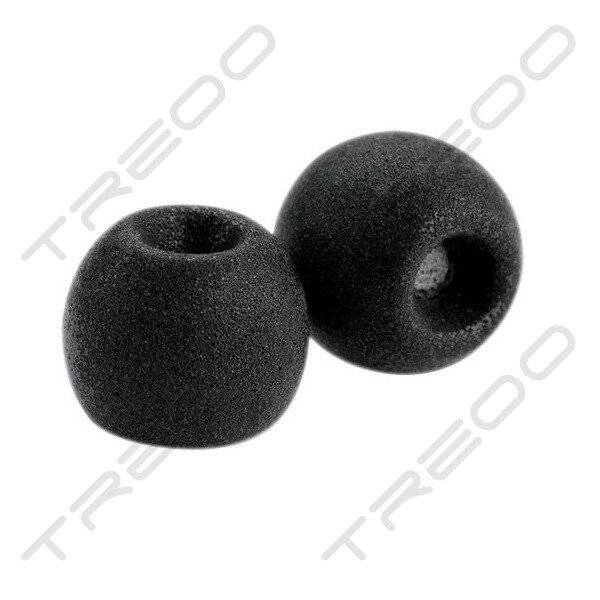 Comfort 200 Foam Tips are round shaped and designed for less ear canal contact to ensure comfort over long listening sessions. When in use, body-heat activated memory foam creates an ultra-soft, comfortable listening experience by conforming to your ear canal. Comply™ Foam is 30x softer than silicone, reducing ear irritation and fatigue, allowing for all day use and enjoyment. Engineered to create a custom ear canal seal to block out external noise and environmental distractions, the Comfort 200 Foam Tips are the next best thing in noise cancellation. Enjoy music without raising the volume to compensate for outside noise. 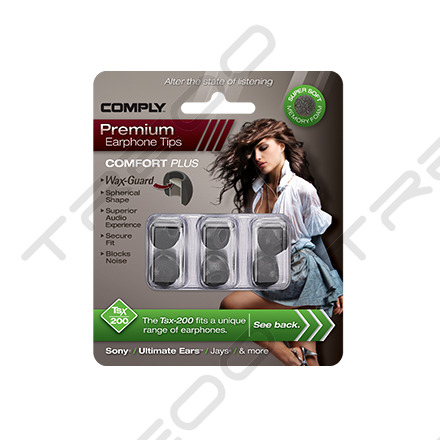 Comply™ Tips provide 2x more dB reduction than standard silicone earbuds. With a perfect ear canal seal, Comply™ tips funnel pure sound directly into the ear. Maximize your listening experience with enhanced bass and exterior noise cancellation. With our Foam Tips, you’ll hear music how it is supposed to be heard with all its highs and lows. Our proprietary memory foam has been crafted to expand to fill the unique shape of your ear canal, creating a custom, snug fit to dramatically increase in-ear retention. This allows for each pair of Comfort 200 Foam Tips to be custom molded to each listener’s ear. Whether you’re running to catch a train or taking a quick lap around the office, we guarantee that your Comfort 200 Foam Tips will stay in place. Our unique WaxGuard™ is available in the Comfort 200 (Tsx-Series). The transparent filter inside the Foam Tips keeps earwax and debris out of the earphone’s soundport without altering the acoustic integrity of your music. These WaxGuards™ will ensure that your Comfort 200s maintain their high sound quality over time. Did you spend months trying to find the perfect set of headphones only to discover that their tips are sub-par? We understand that everyone’s preferences are different. Maybe you want a cord that has no controls on it, or perhaps you feel strongly about the arrangement of drivers utilized to create your perfect sound. Whatever your preference, know that our Foam Tips can make that great set of headphones even better. Our Comfort 200 Foam Tips fit with most major headphone lines. For the first time, I came across such after-market eartips and I wasn't let down at all! The memory foam softness and it's ability to be molded exactly to my ear canal shape is amazing! The size is also perfect. If you own a pair of in-ear monitors or any in-ear earphones, please throw away the stock ones that came with your set, and get a set of Comply's foam tips instead! Take note, however, that there are different models for different brands of earphones, so please do your research properly first before purchasing them!